OTTAWA, IL--(Marketwired - March 18, 2015) - Seattle Sutton's Healthy Eating (SSHE), provider of freshly prepared meals nationwide, announces its nine Slim Down Contestants lost a total of 231 pounds in 10 weeks. The contestants not only lost weight, improved their health, but also the top three finishers won some amazing prizes in the process of this life-changing journey. The first-place winner is Nancy Hodges, 56, from Tinley Park, Ill., lost a total of 42 pounds and 21 percent of her body weight. She also lowered her blood pressure 24 points from 126/86 to 102/75. Nancy and a guest will be heading on a three-night trip for two to Barceló Tucancun Beach in Cancun, Mexico from Apple Vacations. The second-place winner is Julie Adreani, 49, of Elk Grove Village, Ill., lost a total of 34 pounds and 18 percent of her body weight. She also lowered her blood pressure 19 points from 137/90 to 118/78. Julie is $500 richer thanks to Seattle Sutton's Healthy Eating. The third-place winner is Lizz Kwiatek, 44, of Arlington Heights, Ill., lost a total of 24 pounds and 15 percent of her body weight. She also lowered her blood pressure 10 points from 136/91 to 126/78. Lizz will enjoy a $250 shopping spree at Macy's, courtesy of Seattle Sutton's Healthy Eating. Elizabeth Amador, 33 of Des Plaines, Ill., lost a total of 14 pounds and 7 percent of her body weight. Elizabeth Broemmelisiek, 45 of Arlington Heights, Ill., lost a total of 15 pounds and 6 percent of her body weight. Toni Caccamo, 34 of Hanover Park, Ill., lost a total of 38, pounds and 15 percent of her body weight. Dawn Davis, 49 of Streamwood, Ill., lost a total of 26 pounds and 14 percent of her body weight. Roberta Dusek, 66, of Mt. Prospect, Ill., lost a total of 20 pounds and 9 percent of her body weight. Sharon Murphy, 59 of Chicago, lost a total of 18 pounds and 8 percent of her body weight. "We are thrilled to see what these contestants have accomplished by consuming our freshly prepared, healthy meals and know we have given them the tools to continue to achieve their weight loss goals," said Seattle Sutton, RN, BSN, and Founder of Seattle Sutton's Healthy Eating. Sutton continued, "It's not just about weight loss, but achieving a healthy lifestyle and improving overall health. Without good health, nothing else matters." The 2015 contest is the sixth annual SSHE's Slim Down Contest, which began on January 5, 2015, and ran for 10 weeks ending on March 16th. The contestants received 21 complementary SSHE meals per week for a total of 210 meals throughout the 10-week contest. The meals consist of freshly prepared breakfast, lunch and dinner items. Contestants were weighed weekly to monitor their progress. Seattle Sutton's Healthy Eating in cooperation with Apple Vacations and Barceló Tucancun Beach in Cancun, Mexico sponsored the contest. 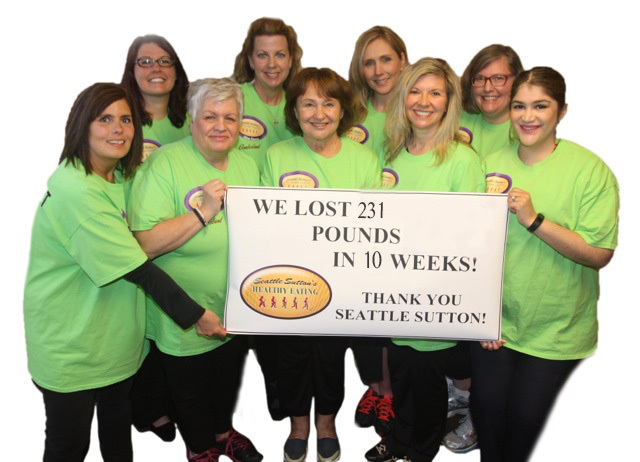 Seattle Sutton's Slim Down Contests are weight loss contests that have transformed the lives of contestants, helping create healthy habits and improve lifestyles. Since the first challenge in 2010, the company has now held six successful contests helping contestants lose a total of 2,421 pounds to date. SSHE is a family-owned, Illinois-based company recognized for dedication to convenient, healthy eating since 1985. SSHE takes the guesswork out of portion control and calorie counting by offering complete, freshly prepared 1,200 and 2,000-calorie (per day) traditional meal plans plus a 1,500-calorie vegetarian plan. A weekly plan consists of three meals per day or 21 meals per week. Meals are available for pick up at select retail locations or via UPS delivery nationwide. To contact Seattle Sutton's Healthy Eating, call 1-800-442-3438 or visit seattlesutton.com. You can also find SSHE on Facebook: facebook.com/SeattleSuttons and follow SSHE on Twitter: Twitter.com/SeattleSutton.